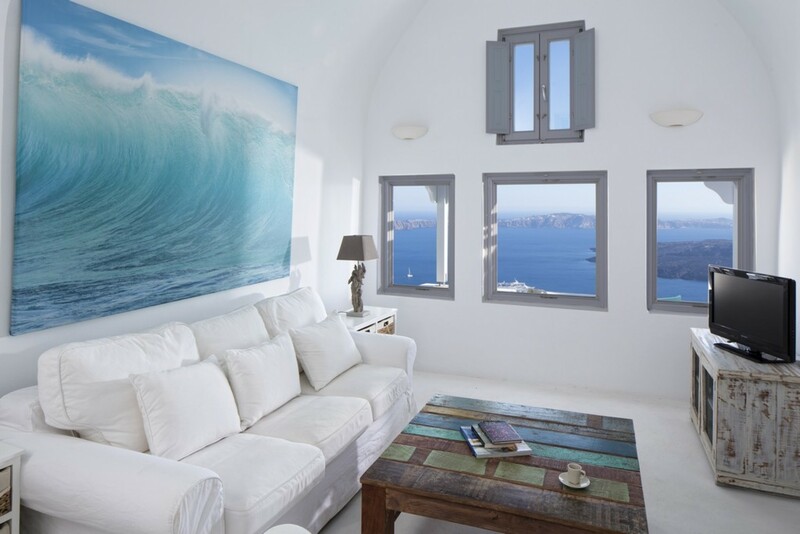 Welcome to Villa Gaia, a stunning 3 bedroom Santorini villa offering breath-taking ocean views combined with phenomenal volcanic views. 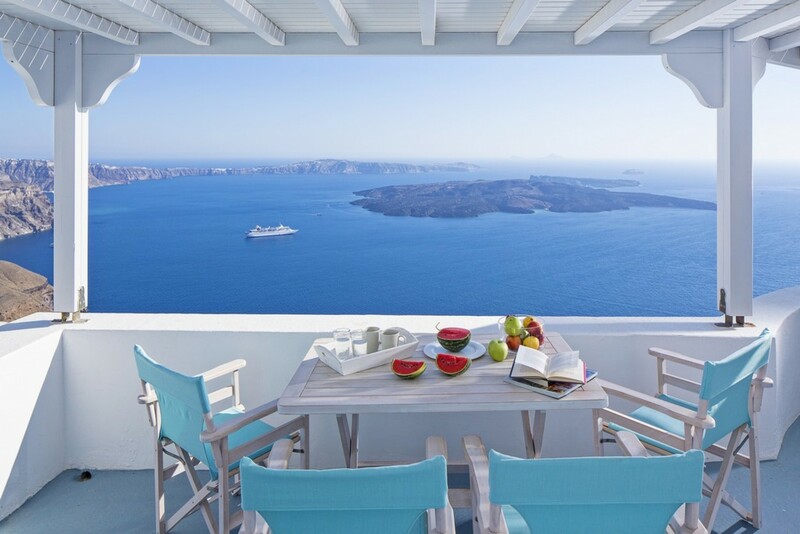 The views are simply to die for! 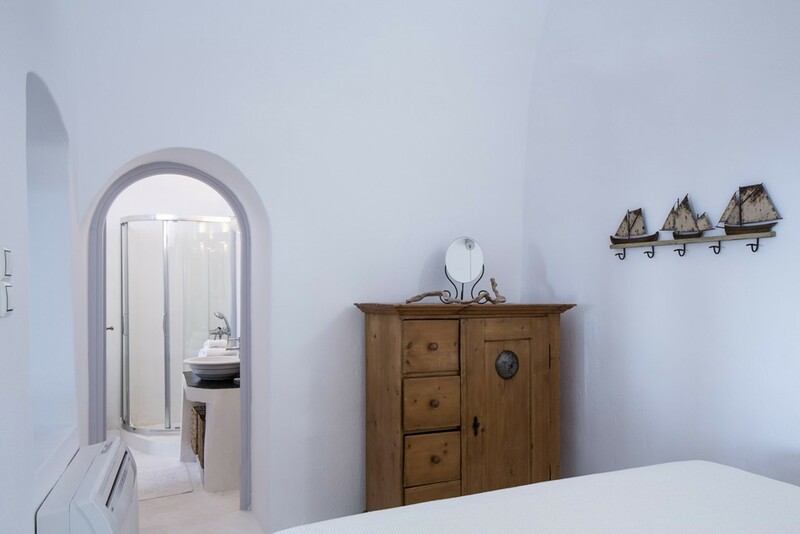 The villa is located in Imerovigli in Santorini, once a working bakery, this villa has been transformed into the perfect hide-away, great for couples or a small group of friends. Gaia has a fantastic elevated position overlooking the ocean. 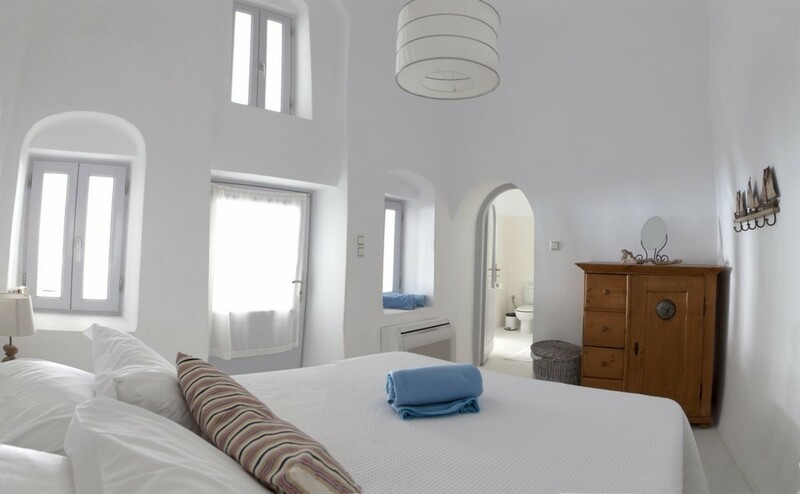 The villa is close to the village of Imerovigli, and guests can enjoy the myriad of shops and excellent restaurants which are within a few minutes leisurely stroll from the houses. 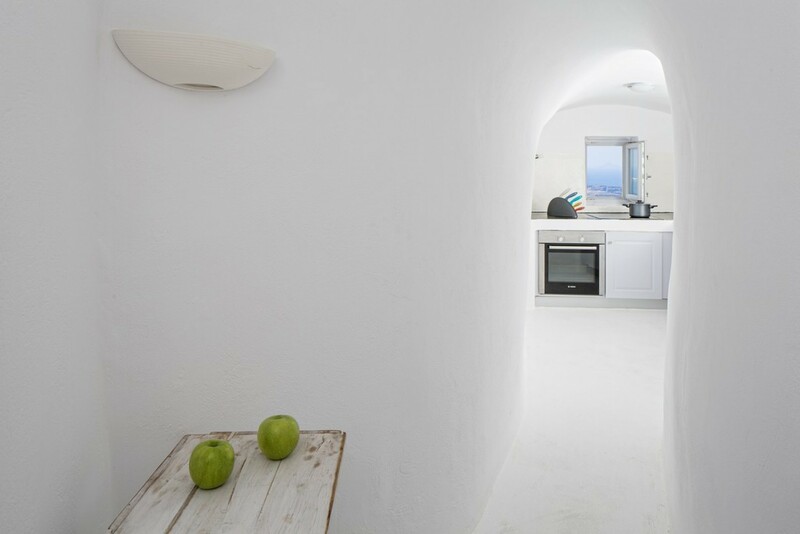 Villa Gaia consists of two cave houses, Villa Nefeli and Villa Nafsika, set on an upper and lower level. 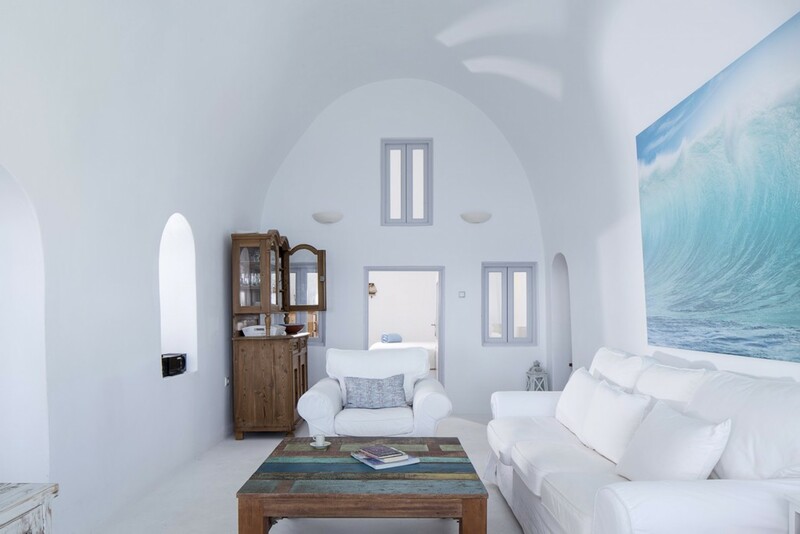 Villa Nefeli is situated on the upper level and offers a smooth, cool sculpted interior with an easy flow from one living area to the next. 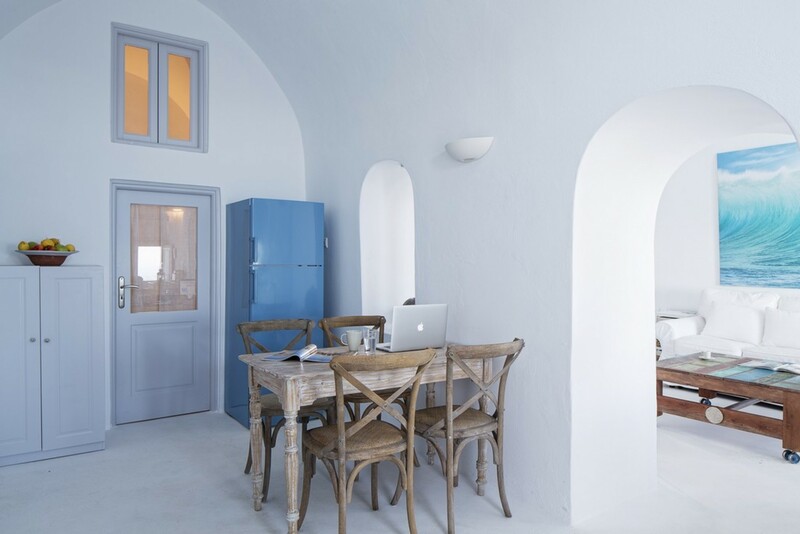 It consists of a light and airy living room, dining area, and well equipped kitchen. The master bedroom leading from the living area, offers a cozy bedroom with double bed and en-suite bathroom. 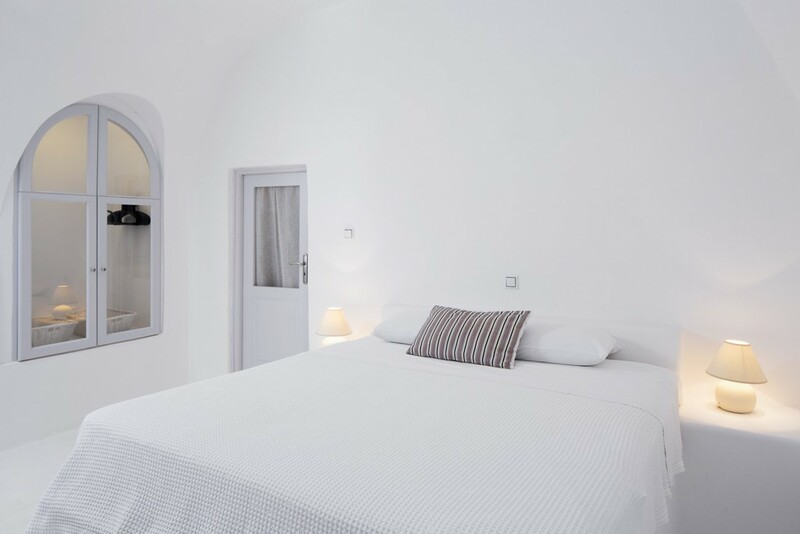 The second bedroom has queen bed, with en-suite bathroom and a vista to knock your socks off. 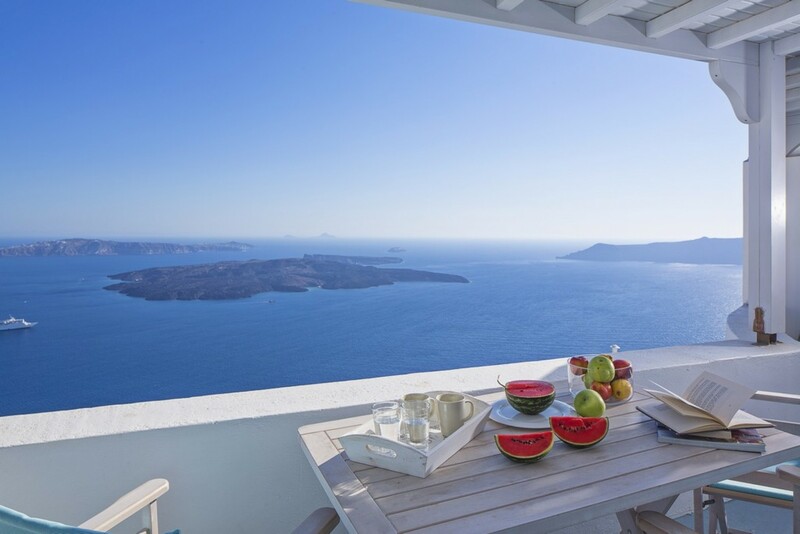 A private balcony provides the perfect outdoor area for enjoying the uninterrupted volcano view. Exterior stairs connect you with the lower floor where you enter Vila Nafsika. 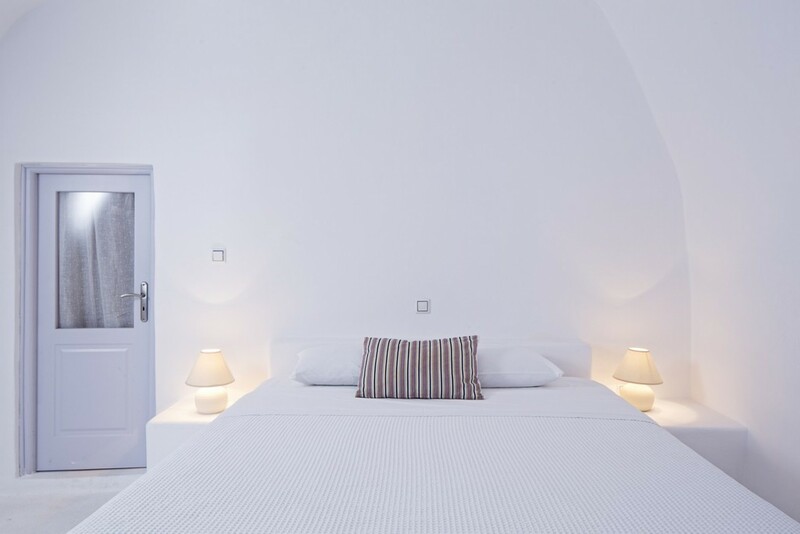 The villa offers fresh white interiors with the continuous flow from living space to bedroom creating a quietly cool and friendly atmosphere. 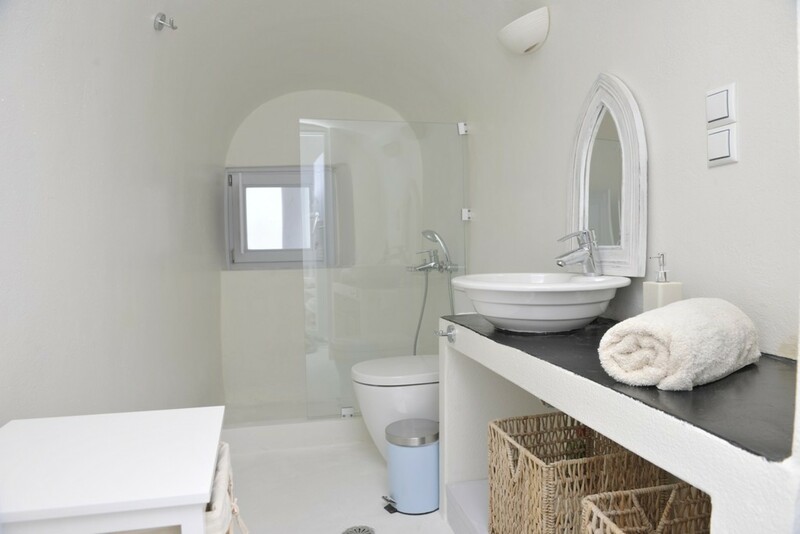 This villa boasts a spacious double bedroom with a gorgeous en-suite bathroom with his and hers vanities. 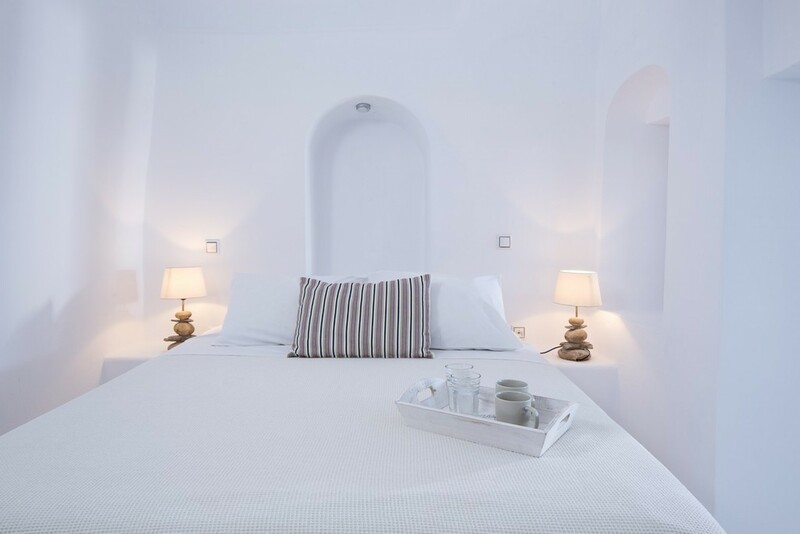 Ideally a villa for two, there is additional sleeping room for extra guests on the banquette style couch, which is serviced by a second bathroom just off the lounge. 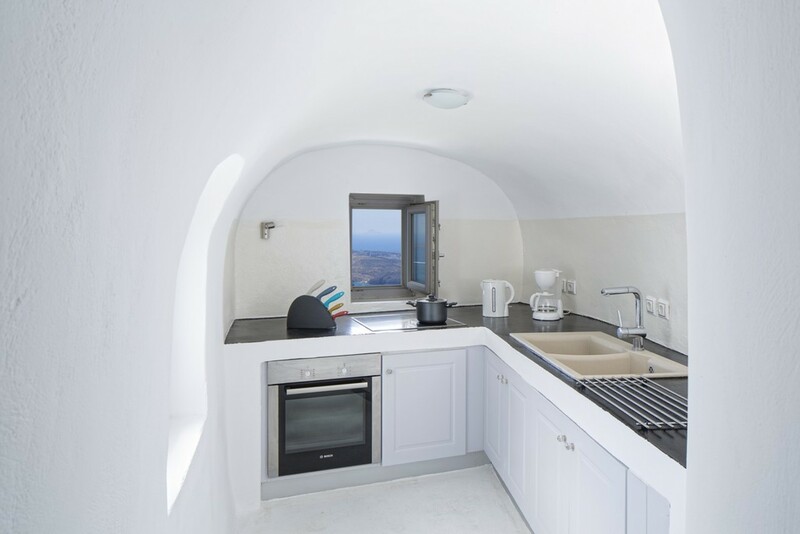 For those who love to cook, the piece-de-resistance of this villa will most definitely be the kitchen – an uninterrupted Caldera view from your stove top. A private sun drenched terrace with soul-stirring views and outdoor Jacuzzi complete the picture - An idyllic setting for a relaxed vacation. 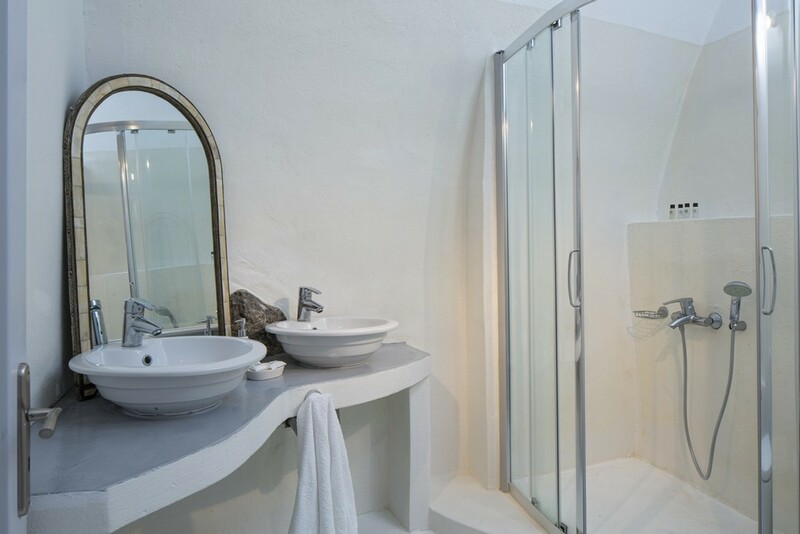 The villas are equipped with fully equipped kitchens, en suite bathrooms with shower, satellite TV, A/C, Internet connection, terraces with fantastic sea views, outdoors Jacuzzi on the lower floor terrace and outdoors furnishings. Daily maid service is included in the villa. We can also arrange a butler and chef at an additional cost. 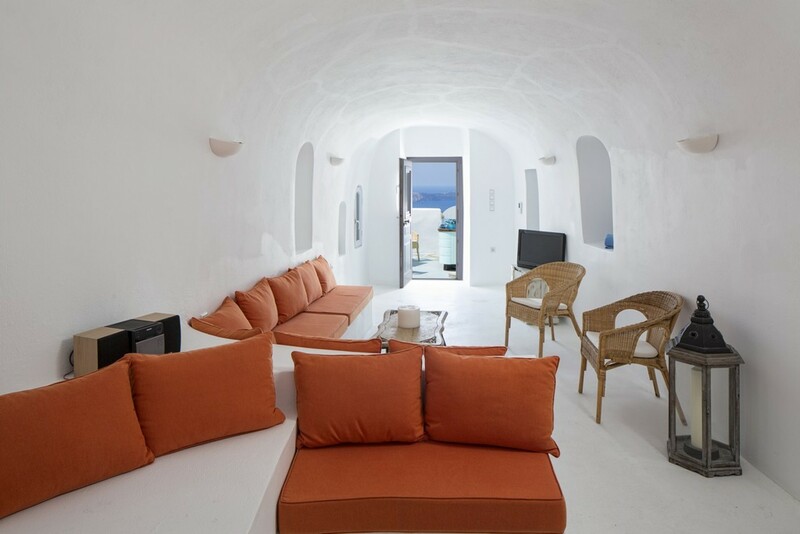 Note: Villa GAIA consists of two cave houses, Villa Nefeli and Villa Nafsika, set on an upper and lower level. 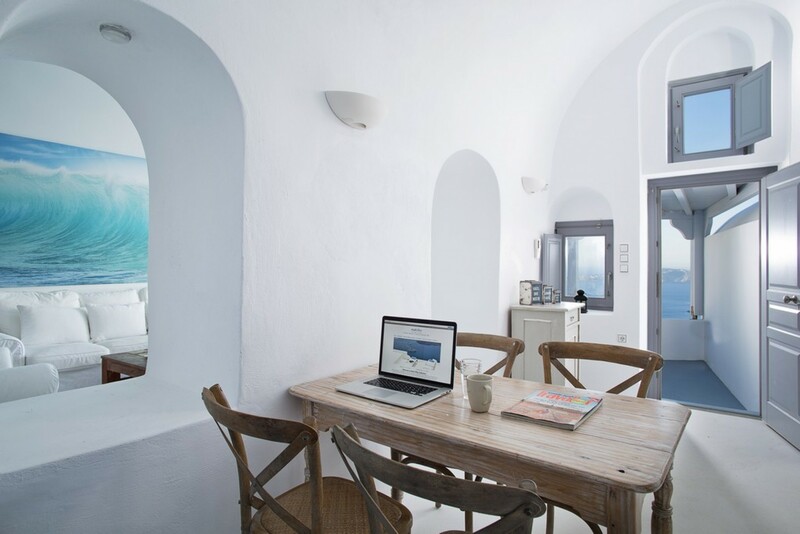 You can rent Villa Nefeli only or both houses Villa Nefeli and Villa Nafsika , as a whole. 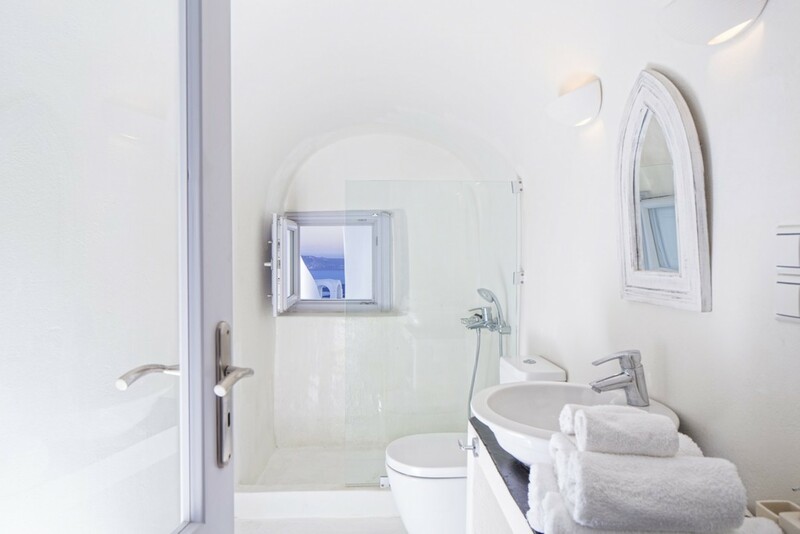 When you rent Villa Nefeli only Villa Nafsika remains closed and you can use the Jacuzzi on the lower terrace privately. 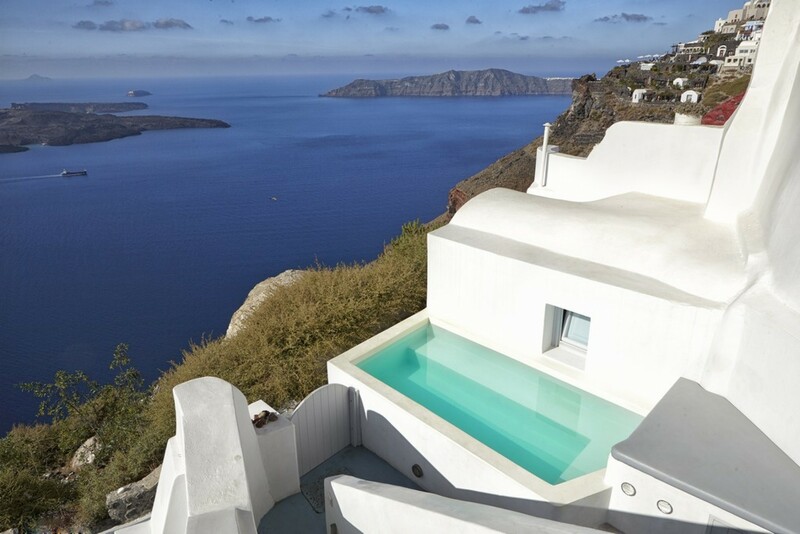 When rented as a whole you use both houses and both terraces with the Jacuzzi. We were a group of 3 couples staying at Villa Gaia and it was perfect. 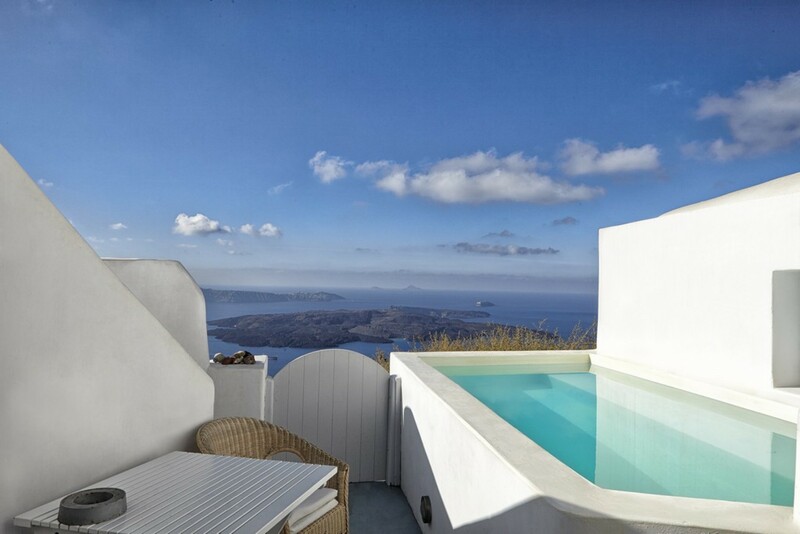 It is such a beautiful villa in the caldera and the views are unbeatable from the villa. Breakfast outside looking out to the ocean was the best! 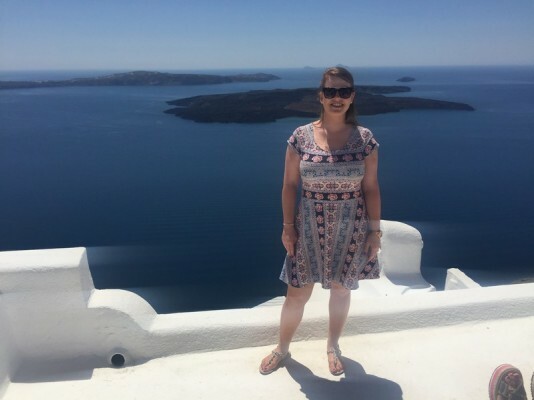 We loved the location as we were able to walk to Fira most evenings and even walked all the way to Oia which was a workout but a great hike to do as you see so much along the way. I would highly recommend this villa. What an amazing villa. The views we enjoyed from this villa were stunning. I found myself just sitting for hours watching the cruise ships and small yachts go by in the distance. 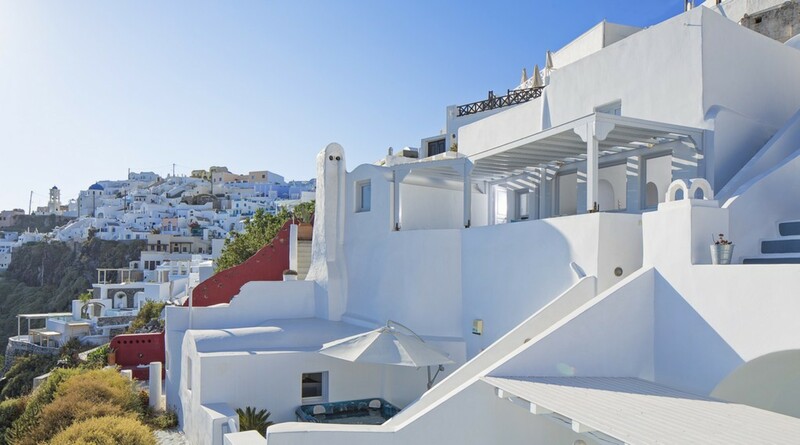 The location in Imerovigli is perfect as you can walk to Fira where there are some great restaurants and shops. 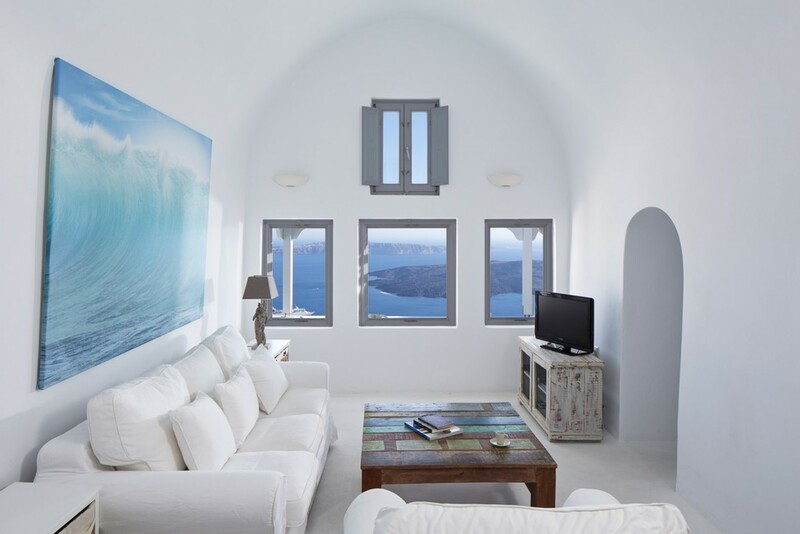 We will definitely be returning to Santorini and Villa Gaia! 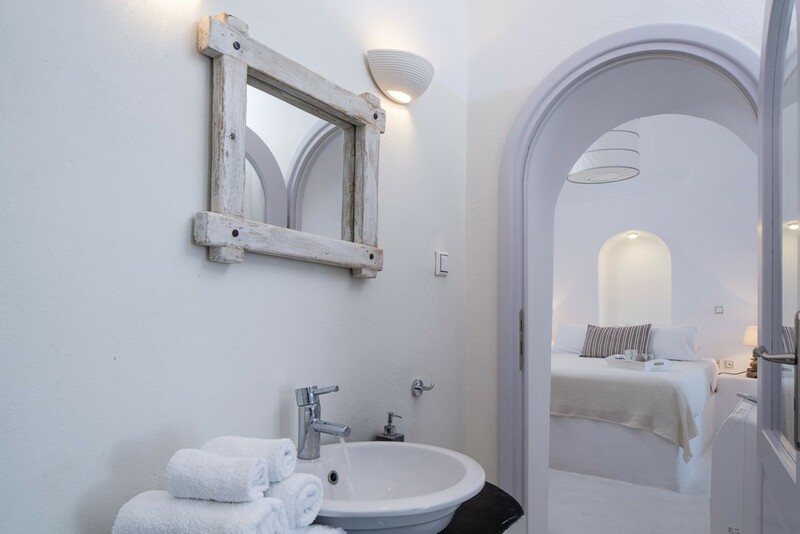 I absolutely love Villa Gaia for a number of reasons. Firstly, it is a beautiful villa inside. It is bright and comfortable and has everything you need. The covered balcony is the best place I have ever enjoyed a morning coffee. 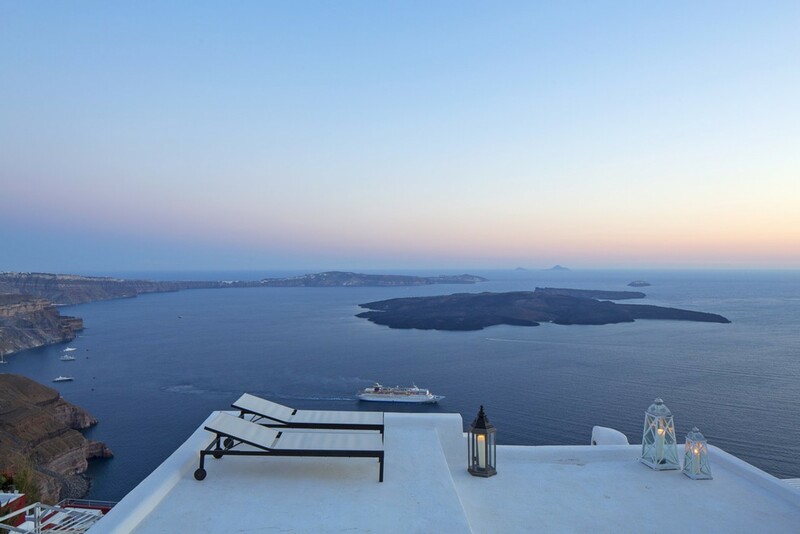 The view is simply incredible and I found I could spend hours sitting there watching the boats go by in the distance. The ocean is so still it looks like a lake. 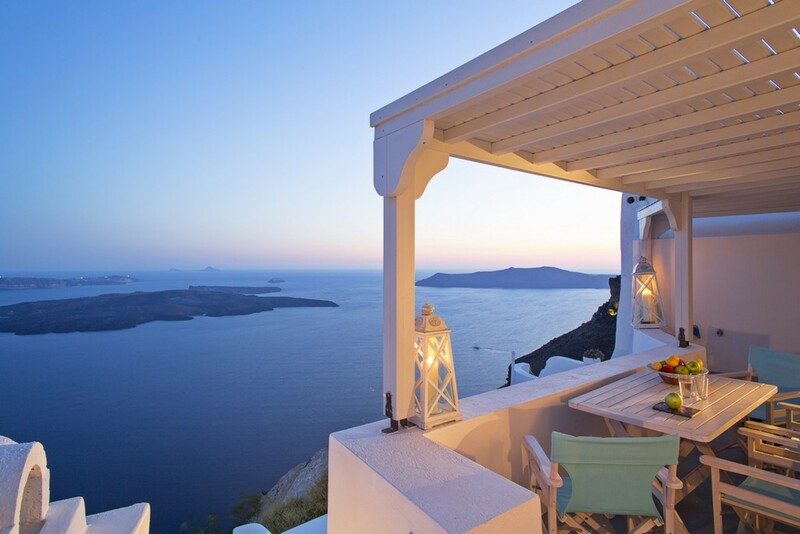 The location of this villa is also perfect. 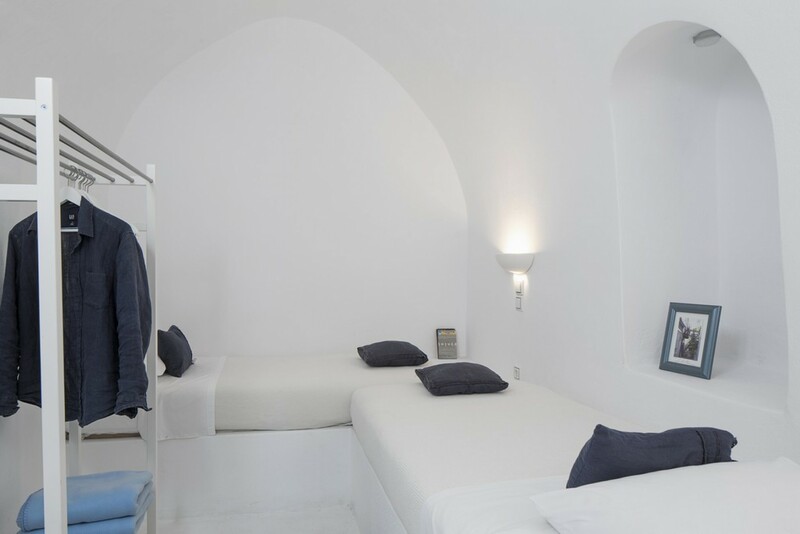 You have restaurants and shops within a 2 minute walk and if you want to walk to Fira, it only takes about 20 minutes. If location is important to your vacation, then this is the perfect villa. 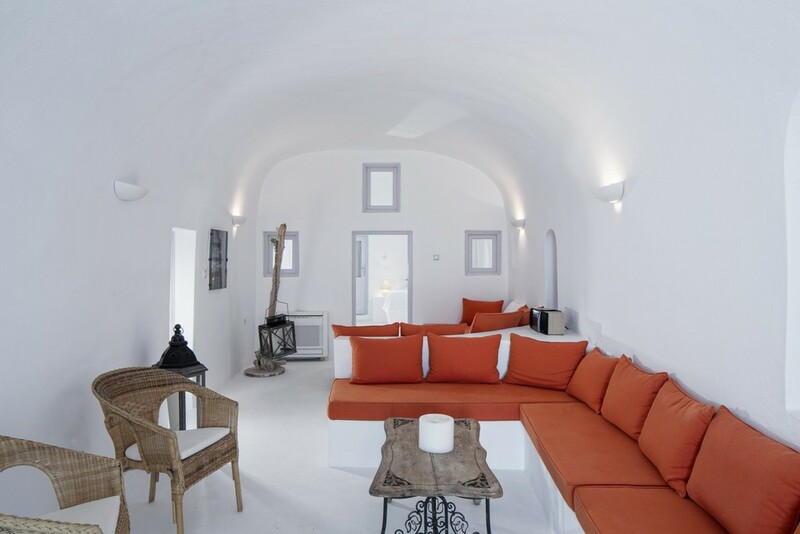 On our recent trip to Santorini we stayed at Villa Gaia. 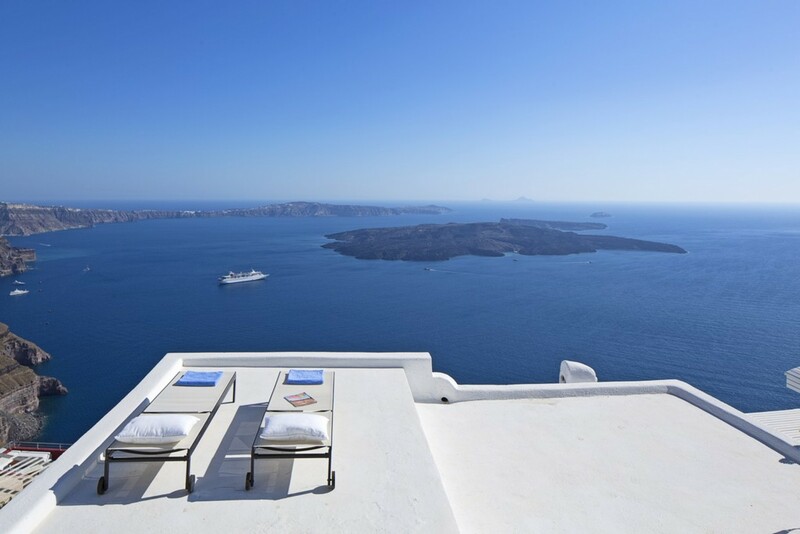 It has one of the best views of any villa in our entire collection of villas worldwide. 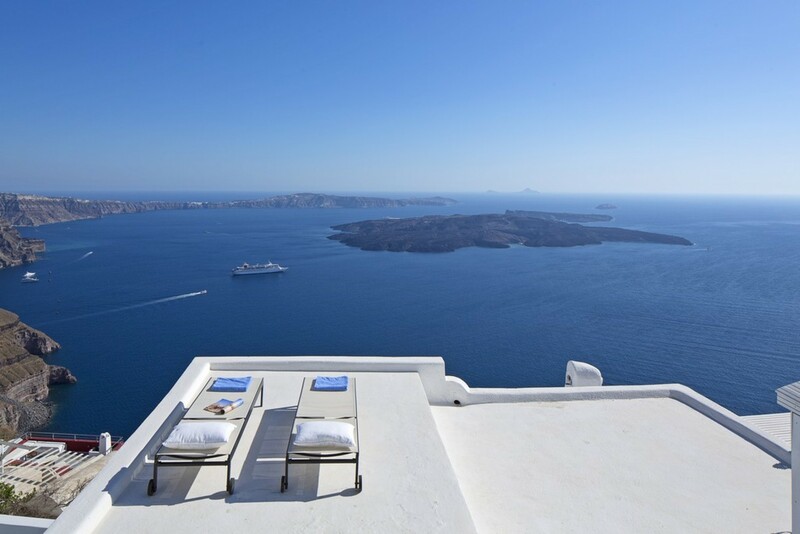 When we arrived in Villa Gaia, I was blown away by the views from the upper terrace - it was the BEST view from any villa in Santorini!! The upper terrace is a great place to relax and sunbathe. There is a nice plunge pool on the lower terrace. We went to the local bakery the first morning which was just 3 minutes walk from the villa. We got a takeaway and had our breakfast on the terrace of the villa overlooking the Volcano. The views are simply spectacular. 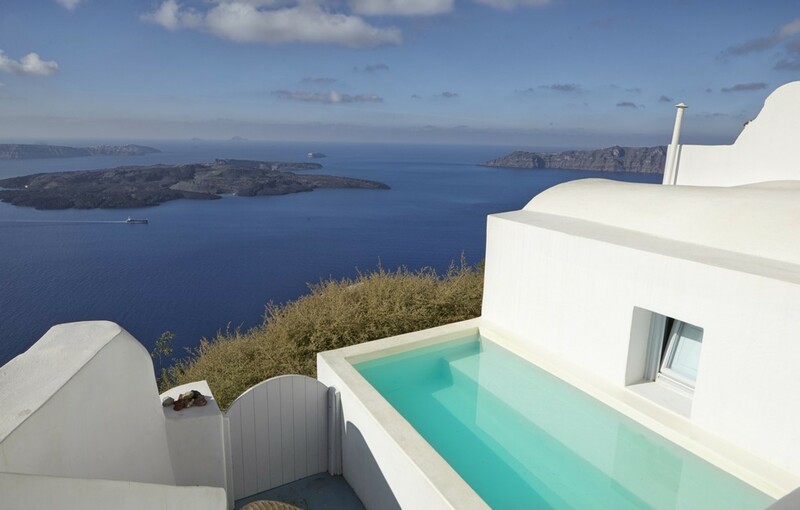 The only things to note is that it is not a very private villa as there are many properties along the Caldera and very few are private. 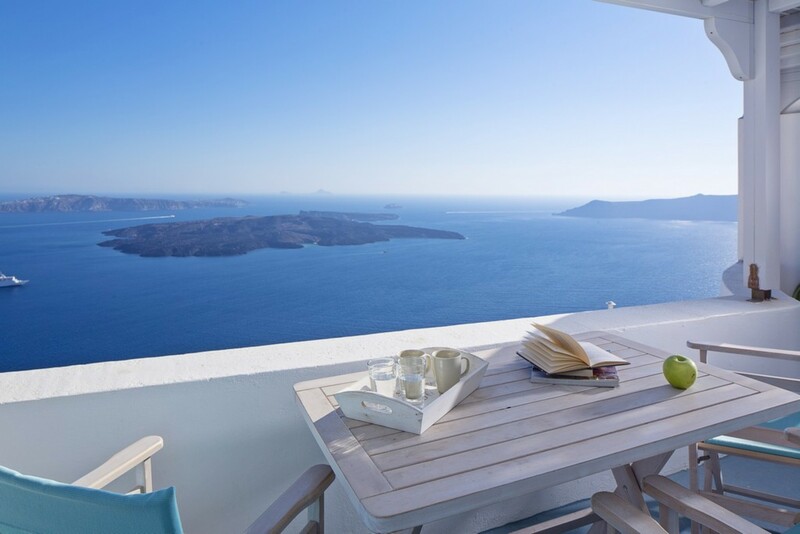 Gaia is overlooked by other villas but to be honest it didn’t bother us as the views by far made up for that drawback and it’s to be expected when staying on the Caldera side. The only other thing to note is that there are steps down to the villa which are a little steep especially for young kids. 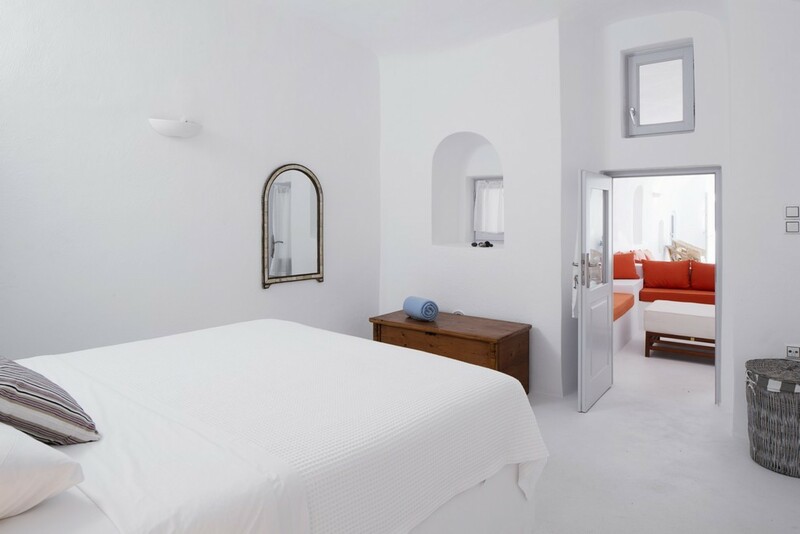 The location of the villa was great close to mini market, bakery, restaurants all within walking distance and you are just 15 minutes walk from Fira. Overall, I would highly recommend Villa Gaia.